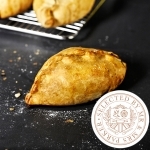 Our finest gourmet Cornish Pasty, hand-made with tender loving care and premium ingredients. 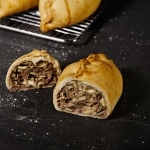 Hand made to a traditional Cornish recipe and using new, improved West Country seasonings, this Cornish Pasty is the very best one we've ever made and a truly premium favourite worthy of your picnic hamper. Best eaten hot, but we won't judge either way! Made famous in the coastal county of Cornwall, Cornish pasties are packed full of flavor. They’re also one of our most popular products. Our pasties are carefully made to a traditional recipe with seasoned chunks of succulent ground beef, tender turnip, soft potatoes and sweet onion all in a delicious pastry with a distinctive crimped finish. Beef, Wheat Flour, Raw Potato, Raw Turnip, Onion, Lard, Water, Gravy Granules (Potato Starch, Maltodextrin, Hydrogenated Palm Oil, Salt, Caramel Color, Artificial Flavor, Wheat Flour, Monosodium Glutamate, Soy Lecithin [an emulsifier] Disodium Guanylate, Disodium Inosinate, Spice & Herb Extract), Salt, Pepper, Glaze (Water, Maltodextrin, Modified Food Starch [Maize, Dextrose (Wheat), Caramel Colors, Carboxymethyl Cellulose (Emulsifier)).